Happy weekend, friends! This post was originally intended to go up yesterday but life happened so I had to delay. We can still enjoy our favorite cocktail on a Saturday night instead, right?! Technically I’m not talking about cocktails but styling out the place where you corral and assemble your favorite cocktail ingredients – the bar cart! This kinda goes without saying that you need booze for your bar cart, but I like to include some pretty bottles to put on display. I am after all a graphic designer, so I very much appreciate good design in all forms, especially packaging. We are big gin/tonic and vodka/soda people so we have a fair amount of those types of liquors on hand but my husband also enjoys a whisky or bourbon nightcap from time to time. I recently got a beautiful bottle of bourbon from Oak & Eden and I just love anything from Far North Spirits. Other bottles that I love (and available at your local ABC stores) are Reyka Vodka and Hendrick’s Gin. This helps to organize and corral all your bottles together. Stick a tray under any grouping of items in your home and it immediately feels more styled and put together. Simple and easy! I recently found this really heavy circular one from Target and I love the contrast of the round shape and light texture against the dark rectangular cart. With no exceptions – every vignette should include something living. Or in my case, something faux that can pass for the real thing. Try using a bunch of flowers, a plant and/or even a small bowl of limes or lemons to add life, color and movement to your bar cart. 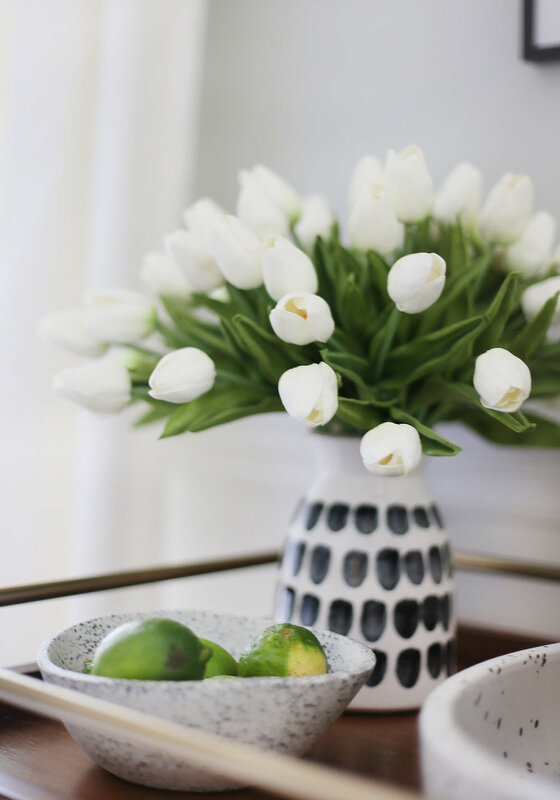 This tip works in any vignette in your home! This is kinda another given on any bar cart to add style and symmetry and I love incorporating a couple of copper mugs into the mix for color and texture. I’m not terribly fancy and find the most beauty from simple shapes. I got these tall tumblers from Target (they were $2.50 each!) and paired them with my copper mugs. If you dig the look of copper, I recently found these and think they would be amazing on display! This will add a bit of personality and interest to your vignette. I go back and forth on putting something decorative vs functional in my bar cart and I lean towards the latter. I recently got that Terrazzo bowl from Port of Raleigh and I love the texture it adds. 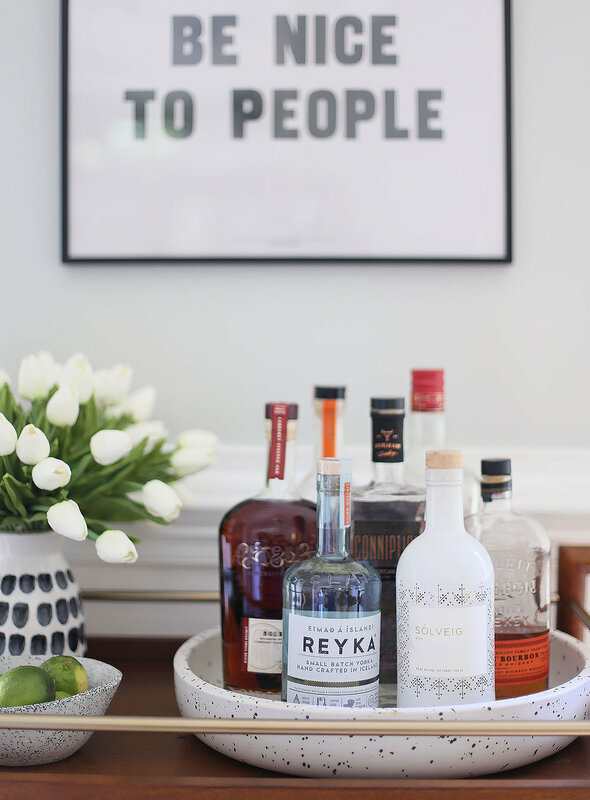 Last but not least, adding art will give your bar cart a bit of personality and add visual interest. Personally, I like to hang the art around my bar cart, but leaning a smaller framed piece on one of the shelves would also work very nicely and add some height. I love my Schoolhouse Electric print and really any of their art would be lovely on or around a bar cart. I say choose art that you love and makes you happy! No go forth and get your booze styling on! And when you are done, sit back and relax with a refreshing cocktail and enjoy the view!